If one was to do a side by side x-ray or dissection of a fiberglass 3 dB versus, say, a 10 dB antenna, what would look different? All VHF Marine Band antennas are vertical linear-polarization and omni-directional in their azimuth pattern The gain in larger antennas is achieved by adding more radiating elements in-line with the first element, called collinear stacking. Typically the feed system by which the transmitter power is applied to all collinear elements is designed so the elements are all being fed power in-phase. This tends to produce one major lobe with gain. The more elements in the collinear stack, the more gain. Obtaining good power distribution and maintaining good phase alignment are important for creating gain. This is why some antennas that are 4-foot long work better than ones 8-feet long. Gain is not obtained automatically with greater length; good design, good manufacturing, and good tuning produces gain, not just length. There are two 4-bay antennas on this tower. The 4-bay antennas are fed in parallel through a phasing and power distribution harness that tries to provide each individual element with equal power in matching phase. Between the two 4-bay open arrays is a UHF antenna encased in a fiberglass tube. It likely has a similar arrangement of four collinear elements, but they are likely being fed in series in some manner with delay or phasing lines between them. In specialized applications, a stacked collinear vertical array can utilize power distribution and phase to accomplish control of the main lobe, directing it up or down. This is called "beam tilt." 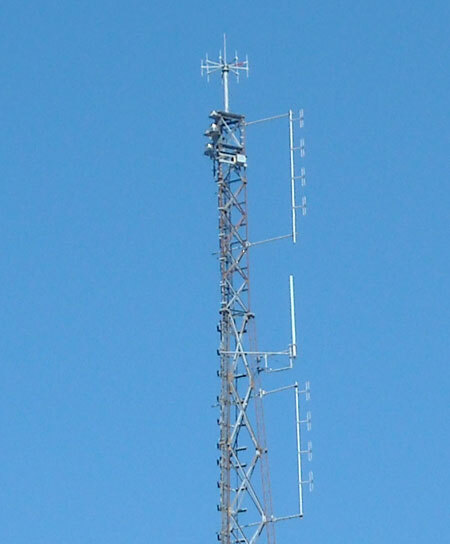 Employing an antenna with some beam tilt is common for antennas mounted on very tall structures. For example, an antenna at 1,000-feet above ground would have a radio horizon distance of 44.8-miles. If the antenna is intended as a broadcast antenna to serve the local area, the antenna would likely be designed with some downward beam tilt so that its main lobe was not at the horizon. Or the antenna would be designed with a minor lobe that filled in the coverage at downward angles. Anecdote: When the 6-element vertical collinear array of a TV station transmitter in Southfield developed a problem with the feed to one element, the first indication of the discontinuity came from viewers complaining about poor signals--not from distant viewers but from very local viewers within a few miles of the transmitter site. The beam fill pattern was affected by the lost element in the array much more than the main lobe was. The signal at a mile or two from the antenna went way down. The signal at the radio horizon was hardly affected. The VSWR bandwidth of the antenna tends to improve as the length/diameter ratio decreases; larger diameter means wider bandwdith. The number of stacked collinear radiating elements is generally proportional to the antenna length and gain. The length of the radiating elements is usually either 0.25-wavelength, 0.5-wavelength, or 0.625-wavelength. Some manufacturers mention in their specification what length radiating element or elements are used. Generally 0.625-wavelength is the longest, due to that being the longest length that produces one major lobe and a very small minor lobe. Longer lengths begin to produce two or more major lobes at different vertical angles. Major lobes above the horizon are generally of no use in marine communication. The creation of an electrical counterpoise for the antenna can be accomplished in many ways--or sometime omitted and left to chance. Some antenna designs incorporate specific elements as counterpoise. There are many methods of matching the antenna feed point impedance to the transmission line impedance; there is no telling what method is employed, other than by noting the DC continuity of the coaxial input between center and shield. This can sometimes give a clue to the matching method. Antennas with DC continuity generally have some sort of shunt element in the matching network that is an inductor. I found an old VHF Marine Band antenna that I had obtained years ago and disassembled. It took me a bit of searching to find this, but, as Chris says, I never throw out anything. This antenna was a mid-priced eight-foot antenna encased in a fiberglass housing from a major manufacturer, probably Shakespeare. The fiberglass housing (or radome) failed, probably due to some sort of impact or stress. The fiberglass portion was fitted and adhered to a metal ferrule that could be threaded onto a 1-inch x 14 threaded mount--in other words, a very typical antenna often described as a "6 dB gain" antenna. a length of 50-Ohm coaxial transmission line similar to RG-58 with white outer insulation but having no markings, which extended for about 52-inches until it exited the antenna housing at the metal ferrule base, evidenced by a permanent bend and some discoloration in the insulation from passing through a rubber grommet. The broken junction in the radiating element; the center conductor of the lower element exited via a hole and was soldered to the radiator here. The lower end of the radiator, with a trombone capacitor and transmission line. The details of how the transmission line and trombone capacitor were connected have been lost because the transmission became disconnected from the antenna. The overall length of the radiating portion of the antennas is 36-inches, the combined lengths of the 25-1/2 broken top section and 10-1/2-inch length of the associated bottom section. In terms of radio wavelength at 157-MHz, this represents a length of just under one-half wavelength. The antenna can be described as an end-fed half-wavelength vertical. Of the overall eight feed of antenna housing, we see that only three-feet of the assembly is the actual antenna radiating element. The upper 7-inches are just a piece of string. The next 36-inches are the antenna radiator, and the remaining 52-inches are just transmission line. The overall housing can be described as a three-foot antenna mounted 4-foot 6-inches above the housing base by a string suspension. Because there was damage to the connections at the base of the antenna, it is not possible to be certain exactly how the antenna was connected to the transmission line. The base seems to provide for a trombone capacitor, a mechanical method of constructing a small capacitor value by inserting a conductor with good insulation inside a tube, making a coaxial capacitor. The capacitor is formed by the capacitance between the inner and outer conductors, and the longer the tube the conductor can be inserted creating more capacitance. In this instance the value of capacitance would be small, a few picofarads. The capacitor may have been part of an impedance matching network to better match the radiation resistance of the antenna to the 50-Ohm transmission line. I suspect that the length of the tube was determined by experiment when the antenna was designed and prototyped. The existence of a conductor running up inside the radiating element and connecting to the radiator at an elevated point is also likely a manifestation of a impedance matching technique. If the transmission line connected to the very end of a half-wavelength radiator, the impedance at that point would be extremely high, several thousand Ohms, resulting in a very poor match to 50-Ohms. By moving the actual connection of the transmission line to a higher point on the radiating element, the impedance would begin to drop. I suspect that this matching point was determined by extensive trial and error experimentation when this antenna design was developed and prototyped. This common "8-foot" fiberglass-encased antenna reveals itself upon disassembly to be a three-foot antenna suspended seven-inches below the top of the housing. The use of a string to suspend the top of the antenna inside the housing is probably only workable at low power levels like 25-Watts. The end of the radiating element is the point of highest voltage on an antenna. The string must be kept dry and have good insulating characteristics to not break down under the voltage stress created by the antenna currents. The most interesting revelation taken from the disassembly of the "8-foot" and "6-dB gain" antenna was the length of the actual radiating element was only 36-inches and was base fed. In comparison, we see that the GAM SS-2 antenna consists of a 36-inch radiating element that is also base fed. The GAM SS-2 antenna is advertised as a "3-dB" gain antenna, causing it to often be dismissed by boaters as insufficient or inferior or in some way lacking compared to antennas rated as "6-dB" gain. It is now clear that this "8-foot" antenna is nothing different than a 3-foot antenna on a 4-foot extension mast. The GAM SS-2 is considerably more durable than the fiberglass-encased antenna I obtained and disassembled after it broke during typical use.